Improving your browsing speed or maintaining the privacy of your Internet connections are some of the reasons why you may be interested in using a proxy. There are several websites that offer this service, but some applications like MultiProxy will also provide you with secure and anonymous Internet browsing. To make MultiProxy work you'll need to update the proxy server list from the link that's provided in the main window or from one of the many websites that are dedicated to this purpose over the Web. 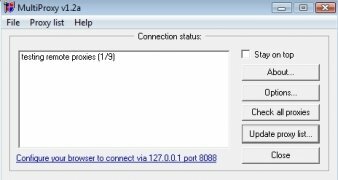 If we have a text file that includes a list of updated proxy servers, we can import it from the program options or it will also be possible to input each one of them one by one manually. After that, with the “Check all proxies” option you'll be able to check if they are available or down. Restricted access to web pages will no longer be a problem. 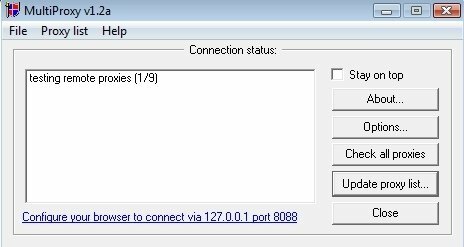 Once you have a proxy that is working, you'll have to configure your default browser so that it connects to the Internet by means of the 127.0.0.1 address and the 8088 port. An indicator on the system tray will let you know if the program is working properly.